In today’s world of multi-million pound budgets, licence ideas and development teams the size of Denmark, it’s refreshing to find teams of 3 or 4 people, sticking two fingers up at software houses like EA. We love game houses like this, they often don’t spend ages on the actual game, and instead making it fun. With all the stick that Xbox Live, PSN & Wiiware gets, they have a great library of ever expanding games. Some are tosh, but the barrier of entry has been reduced, allowing some great games to come out. Often these sorts of games have rubbish graphics, but that’s okay, as the game plays fantastically. However, World of Goo is an addictive game for the WiiWare (and also PC), and has a excellent charm to it with visuals & sound of fantastic quality. This game is a puzzle game, and is a rarity, a completely original game. I guess the closest thing to it in gameplay style is Lemmings. 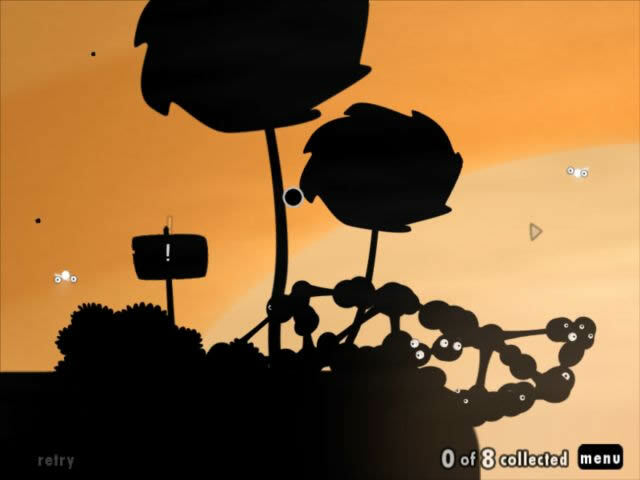 The game’s main objective is that you need to guide a selection of similar yet different globs to the exit, with a minimum number required to advanced to the next level. the way in which you do this is my using the mouse or wiimote to drag the globs to some arbitary space. If the globs are close enough to other globs (usually there’s 3-6 globs in a structure when you start the level), they form a bond that all the other globs can climb on. 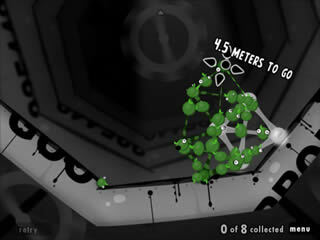 Most levels therefore involve building a bridge or a tower to get to the pipe to exit the level. Sounds easy? Yes, but so did Lemmings. Some levels have great originality, like the tumbler level. The real trickiness in the game revolves around the physics engine, which means that instead of building one string of globs, you have to intricately place your globs to support each other in your construction. You are helped a little bit by some added extras, green globs can be detached from structures, allowing you to effectively “climb” walls in later levels, balloons & weights to guide your globs up and down, allowing you to traverse tight gaps. And tight they are, spikes and other nasty things can end up puncturing your globules. This, and the fact you have a very finite number of globs with which to advance wtih, can make later levels incredibly hard. One other cool thing is the levels are varied. Admittedly, there are only so many times you can build a bridge and for it not to get boring. So instead the designers have concentrated on making each level significantly different. one level, for example, you’re in a rotating drum, and you have to build in such a way to reach the pipe at the top of the level, whilst the drum is rotating. Other levels require you to balance on a see-saw, others require you to float through a gap in the ceiling. It’s really quite clever and ingenius at times. Of course, one problem that seems to blight a lot of “homebrew” games is the graphics and sound quality. Thankfully, this problem is not evident in World Of Goo, as the graphics in the game are a fun yet dark cartoony style, that really show off the power of consoles and a decent PC. The music however is absolutely stunning, it’s a moody orchestral pieces aplenty that will – if the game takes off – be as well known as Lemmings’ little ditties. And that’s the thing, in todays world of FPS’s aplenty & bland tie ins that look good, it’s refeshing to see a game do something truly different and classy. Especially as it’s written by two people, that’s it. I’d love to see more and more people try games like this, but it only going to happen if the game becomes a commercial success as well as a critical success. It’s out for the PC and shortly for the Wii, and it’s well worth getting. This game is sooo addictive. It will be a classic. Music is stunning. Graphics could even be said to be cute. Not only that, there is actually a story line! My favourite character is — the sign writer.